BOOM! Studios is thrilled to announce BODIE TROLL, a new all-ages graphic novel written and illustrated by Jay Fosgitt (Marvel’s Rocket Raccoon & Groot) charging into stores February 2018 about a seemingly fearsome monster who is actually a lovable grump. This giant graphic novel comes in at over 250 pages and includes all the content previously published by Red 5 Comics plus all-new original stories about Bodie’s continuing adventures. The villagers of Hagadorn whisper tales of Bodie Troll’s ferociousness and tread lightly when they cross his bridge. At least, that’s what Bodie would like to think. Despite his desires to strike fear in the hearts of others, Bodie is a cute and cuddly grump of a troll. But what he might lack in ferocity, he makes up for in spirit. Alongside his best friend Cholly and her Fairy Godmother, Bodie has a habit of finding trouble and adventure. If he’s lucky, he just might scare someone along the way. “While Bodie dreams of being the villain of this fairytale world, despite his best efforts, he inevitably winds up the hero every time,” says Fosgitt. BODIE TROLL is the latest release from BOOM! Studios’ critically acclaimed KaBOOM! imprint, publisher of acclaimed licensed series such as Steven Universe,Over the Garden Wall, Peanuts, and Garfield, along with original series like Brave Chef Brianna by Sam Sykes and Selina Espiritu, and The Deep by Tom Taylor and James Brouwer. 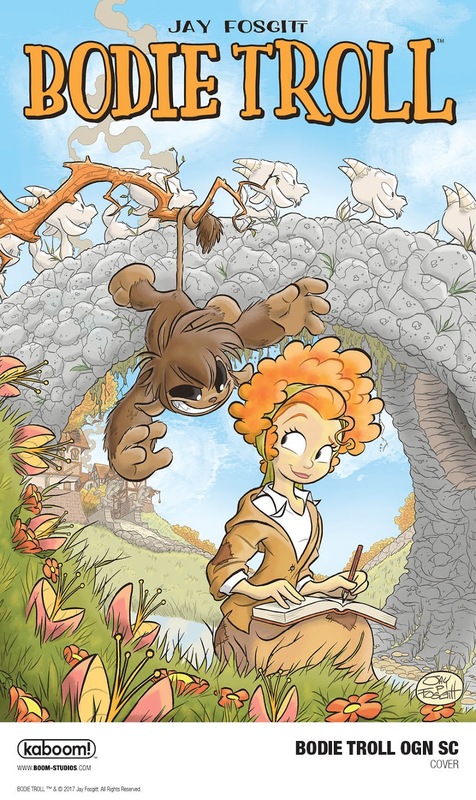 “Jay Fosgitt is an amazing cartoonist and BODIE TROLL is great story filled with lovable, awkward, and always relatable characters,” says Whitney Leopard, Editor, BOOM! Studios. Print copies of BODIE TROLL will be available for sale February 2018 at local comic book shops (use comicshoplocator.com to find the nearest one); booksellers including Amazon, Barnes & Noble, and Books-A-Million; or at the BOOM! Studios webstore . Digital copies can be purchased from content providers including comiXology, iBooks, Google Play, and the BOOM! Studios app.